As vintage vixen Marilyn Monroe sang, diamonds are a girl's best friend. They've come to symbolize the height of affluence and affection. Though the baubles have been in vogue only since the 1950s, these minerals have existed deep inside the Earth for billions of years. And while they aren't any rarer than rubies, emeralds or sapphires, diamonds' unique properties put them a cut above the rest. Diamond is the most concentrated form of pure carbon in the natural world and the strongest mineral on Earth, far exceeding other carbon allotropes such as graphite and fullerite. The secret to diamond's superior strength is found on the molecular level. Carbon atoms possess four valence electrons available for bonding. In diamond crystals, each of those four free electrons forms a covalent bond with a valence electron of a neighboring carbon atom. Since all of the free electrons are bonded uniformly, it creates a rigid tetrahedral lattice that gives the coveted mineral its prized properties. The organic process of diamond formation requires four key ingredients: carbon, pressure, heat and time. When it comes to heat and pressure, the specific conditions are at least 752 degrees Fahrenheit (400 degrees Celsius) and 434,113 pounds per square inch (30 kilobars). Prime diamond real estate is located about 100 miles (160 kilometers) underground in the Earth's mantle. There, diamonds have formed over billions of years from heated and pressurized carbon. Hundreds of millions of years ago, eruptions of magma from the mantle propelled natural diamonds closer to the Earth's surface. The funnel-shaped areas carved out by the magma eruptions are called kimberlite pipes, named for the first formation discovered in Kimberley, South Africa. Gradually, the tops of the pipes eroded, exposing the diamonds below. Erosion can also carry diamonds from their original location into riverbeds and coastal lands. In its roughest form, diamond ore doesn't look like the shiny nuggets atop engagement rings. Diamonds must be sorted, cut and polished to bring out their luster. Like 18th-century alchemists striving to turn common elements into gold, geologists long sought out methods for creating synthetic diamonds. According to the American Museum of Natural History, Swedish and American researchers cracked the carbon code in the 1950s to convert graphite and molten iron into diamond. The most authentic man-made diamonds today are manufactured by subjecting pure carbon to intense heat and pressure in a simulation of the organic process. To the naked eye, these synthetic diamonds are indistinguishable from natural ones -- and fetch a lower price to boot. 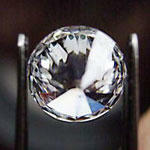 Since the cartel De Beers controls a majority of the world's diamonds, the price tag seldom drops. However, as the world's most durable mineral, diamonds are in high demand even outside of the fashion accessory market. According to the Natural Museum of History, diamonds conduct heat five times faster than copper, can pass or block electrical currents and endure extreme temperatures and chemical exposure. The sharpened gems are employed as specialized drill bits, for instance, and synthetic diamonds have opened the possibility of applying them to microchips and semiconductors. Whether produced in the Earth's mantle or a high-powered pressure cooker, diamonds are valued equally for their beauty and their practicality. Given the gems' potential applications, tomorrow's diamond spokesperson may be more along the lines of Bill Gates than Marilyn Monroe.